Since 1998, CIMT College has been at the forefront of providing customized and industry-relevant skill-building workshops and training to small, medium and large organizations. Our ability to provide customized training at an affordable price is highly valued by our clients. ASK4CARE approached CIMT College with an urgent requirement for Microsoft Excel training for one of its newly hired employees. Her job responsibilities included updating and maintaining worksheets on Microsoft Excel, so it was important that she receive customized training on Microsoft Excel to suit her unique needs. The focus was to teach her the essential skills to get her up and running quickly. Another objective was to make her aware of the advanced concepts in Microsoft Excel, so that she could adequately meet future challenges. Our experienced Instructor, Harpreet, ensured that apart from the classwork, the student was given challenging practice assignments to build the required skills. 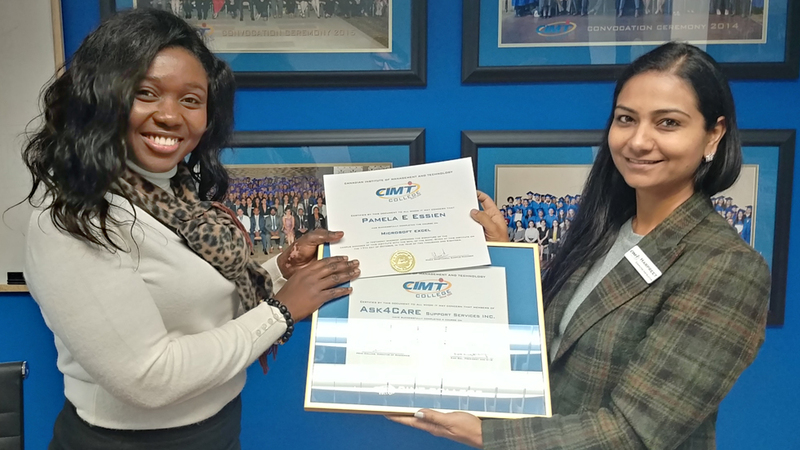 This customized training helped the student to build her confidence and advance her Excel skills, and upon completion, the student was presented with the certificate from CIMT College. CIMT College offers hundreds of short term and certification courses in areas of business, technology, computer skills, healthcare, community care, trades, telecommunication, and many more. We work with the client to decide the content, duration, timing, and location of the training. Whether it’s group training or a personalized one-on-one, CIMT College endeavours to deliver exceptional value to all of our corporate clients.